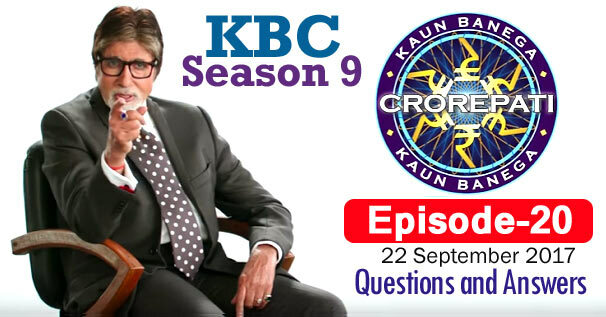 KBC Season 9 Episode 20 Questions and Answers: The twenty-episode of Season 9 of Kaun Banega Crorepati (KBC) was telecast on 22nd September 2017. In which Amitabh Bachchan had asked contestants 16 questions of General Knowledge. The correct answer to all the questions is given below each question. By reading these questions, you can prepare yourself for the next KBC Season 10 of Kaun Banega Crorepati. Because by reading these questions, you will understand what kind of questions asks Amitabh Bachchan in KBC. These all general knowledge questions will be helpful to for you various Competitive Examinations and Interviews besides KBC. Remember, the answer to some question may be in accordance with that time, while the answer to those question may differ according to the present time. 1. Adding 'table' and 'lawn' before which of these words forms the names of two different sports ? 2. On which actress was this song originally picturised ? 3. Which of these is nearest to the south pole ? 4. In which year will we celebrate the 150th birth anniversary of Mahatma Gandhi ? 5. Which member of the cat family is largest in terms of length and weight ? 6. Which of these monuments or landmark was built by the Mughals ? 7. Who was presented with the Dadasahib Phalke award in May 2017 ? 8. Who among these has served as the Ambassador of India to the United Nations ? 9. Who was the first Indian women to win the world Junior Badminton Championship ? 10. In the film 'Sholay' Whom did Kaalia address as 'sardaar' in the dialogue "Sardaar, maine aapka namak khaya hai"
This song is featured in which film ? 12. From this musical prelude, identify the song ? 13. Which of these is not the full form of one of the Sapta-Swaras in Indian Classical music ? 14. Whose voice is this ? 15. The cave temples at the historical site of Elephanta are dedicated to which god ? 16. Who became the first Indian woman to join the international Olympic Committee ?